and grab the RSS feed to stay updated. See you around! Are you tired of the Chipmunks destroying your flower gardens? Did you injury yourself on a chipmunk burrow? Eco Wildlife Solutions offers you a service to trap, remove, and relocate Chipmunks from your yard. Chipmunks are a burrowing squirrel. They spend their day expanding their burrows in your yard. These burrows can cause erosion issues. We offer tried and true methods to remove Chipmunks from your property. We know that they are a cute animal to observe, but if your having issues with them contact us to resolve the problems. We will solve your Chipmunk problems. Serving Metro Atlanta, Bremen, Carrollton, College Park, Columbus, Fayetteville, Franklin, Grantville, Greenville, Griffin, Hogansville, Jonesboro, La Grange, Lovejoy, McDonough, Newnan, Peachtree City, Riverdale, Union City, West Point, and surrounding cities. Call (678)340-3269 to schedule an appointment. As seen here, chipmunks will eat your grapes and muscadines off the vines. (Eutamias minimas), discussed here, are the two most widely distributed and notable species. Behavior and damage is similar among all species of native chipmunks. Therefore, damage control recommendations are similar for all species. The eastern chipmunk is a small, brownish, ground-dwelling squirrel. It is typically 5 to 6 inches (13 to 15 cm) long and weighs about 3 ounces (90 g). It has two tan and five blackish longitudinal stripes on its back, and two tan and two brownish stripes on each side of its face. The longitudinal stripes end at the reddish rump. The tail is 3 to 4 inches (8 to 10 cm) long and hairy, but it is not bushy (Fig. 1). The least chipmunk is the smallest of the chipmunks. It is typically 3 2/3 to 4 1/2 inches (9 to 11 cm) long and weighs 1 to 2 ounces (35 to 70 g). The color varies from a faint yellowish gray with tawny dark stripes (Badlands, South Dakota) to a grayish tawny brown with black stripes (Wisconsin and Michigan). The stripes, however, continue to the base of the tail on all least chipmunks. Chipmunks are often confused with thirteen-lined ground squirrels (Spermophilus tridecemlineatus), also called “striped gophers,” and red squirrels (Tamiasciurus hudsonicus). The thirteen-lined ground squirrel is yellowish, lacks the facial stripes, and its tail is not as hairy as the chipmunk’s. As this squirrel’s name implies, it has 13 stripes extending from the shoulder to the tail on each side and on its back. When startled, a ground squirrel carries its tail horizontally along the ground; the chipmunk carries its tail upright. The thirteen-lined ground squirrel’s call sounds like a high pitched squeak, whereas chipmunks have a rather sharp “chuck-chuck-chuck” call. The red squirrel is very vocal and has a high-pitched chatter. It is Chipmunks are generally solitary except during courtship or when rearing young. The least chipmunk inhabits low sagebrush deserts, high mountain coniferous forests, and northern mixed hardwood forests. The home range of a chipmunk may be up to 1/2 acre (0.2 ha), but the adult only defends a territory about 50 feet (15.2 m) around the burrow entrance. Chipmunks are most active during the early morning and late afternoon. Chipmunk burrows often are well hidden near objects or buildings (for example, stumps, wood piles or brush piles, basements, and garages). The burrow entrance is usually about 2 inches (5 cm) in diameter. There are no obvious mounds of dirt around the entrance because the chipmunk carries the dirt in its cheek pouches and scatters it away from the burrow, making the burrow entrance less conspicuous. In most cases, the chipmunk’s main tunnel is 20 to 30 feet (6 m to 9 m) in length, but complex burrow systems occur where cover is sparse. Burrow systems normally include a nesting chamber, one or two food storage chambers, various side pockets connected to the main tunnel, and separate escape tunnels. With the onset of cold weather, chipmunks enter a restless hibernation and are relatively inactive from late fall through the winter months. Chipmunks do not enter a deep hibernation as do ground squirrels, but rely on the cache of food they have brought to their burrow. Some individuals become active on warm, sunny days during the winter. Most chipmunks emerge from hibernation in early March. Eastern chipmunks mate two times a year, during early spring and again during the summer or early fall. There is a 31-day gestation period. Two to 5 young are born in April to May and again in August to October. The young are sexually mature within 1 year. Adults may live up to 3 years. Larger than the chipmunk, has a bushier tail and lacks the longitudinal stripes of the chipmunk. Red squirrels spend a great deal of time in trees, while chipmunks spend most of their time on the ground, although they can climb trees. The eastern chipmunk’s range includes most of the eastern United States. The least chipmunk’s range includes most of Canada, the US Rocky Mountains, the Great Basin, and parts of the upper Midwest. Eastern chipmunks typically inhabit mature woodlands and woodlot edges, but they also inhabit areas in and around suburban and rural homes. Adult least chipmunks mate over a period of 4 to 6 weeks from April to mid-July. Least chipmunks produce 1 litter of 2 to 7 young in May or June. Occasionally a second litter is produced in the fall. Chipmunk pups appear above ground when they are 4 to 6 weeks old — 2/3 the size of an adult. Young will leave the burrow at 6 to 8 weeks. Population densities of chipmunks are typically 2 to 4 animals per acre (5 to 10/ha). Eastern chipmunk population densities may be as high as 10 animals per acre (24/ha), however, if sufficient food and cover are available. Home ranges often overlap among individuals. The diet of chipmunks consists primarily of grains, nuts, berries, seeds, mushrooms, insects, and carrion. Although chipmunks are mostly ground-dwelling rodents, they regularly climb trees in the fall to gather nuts, fruits, and seeds. Chipmunks cache food in their burrows throughout the year. By storing and scattering seeds, they promote the growth of various plants. 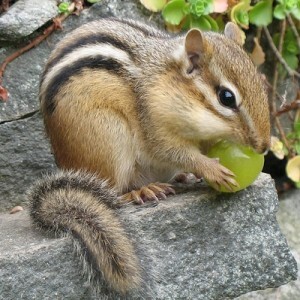 Chipmunks also prey on young birds and bird eggs. Chipmunks themselves serve as prey for several predators. Throughout their North American range, chipmunks are considered minor agricultural pests. Most conflicts with chipmunks are nuisance problems. When chipmunks are present in large numbers they can cause structural damage by burrowing under patios, stairs, retention walls, or foundations. They may also consume flower bulbs, seeds, or seedlings, as well as bird seed, grass seed, and pet food that is not stored in rodent-proof storage containers. In New England, chipmunks and tree squirrels cause considerable damage to maple sugar tubing systems by gnawing the tubes. Call (678)340-3269 to schedule an appointment.